“Nope,” I said, as I gathered together a pile of airlocks and gaskets to fit on the fermentation tanks. What was I doing in Kampot, trying to brew an IPA for Cambodia’s burgeoning craft beer market? We’d just left Chiang Mai, Thailand, where I’d discovered Red Truck IPA – the heavenly creation of the Chiang Mai Beer Company. A good IPA was something I’d been missing since we left the U.S., as Southeast Asian beer (and Cambodia’s beer in particular) isn’t known for being high quality. In most of Southeast Asia, the big breweries make a watery beer that costs around $1 and is vaguely drinkable when served ice cold. For most tourists, that’s enough. They’ll go home and laugh about the inexpensive swill that assisted them in forgetting so many nights of their trip. But as a digital nomad trekking across this region month after month, I’d been craving something with a little more flavor. Fortunately for us, Cambodia is starting to come into its own when it comes to craft beer. In the past several years, as demand for quality beer has skyrocketed in the U.S., craft breweries have been popping up around the world, including here in the Kingdom. 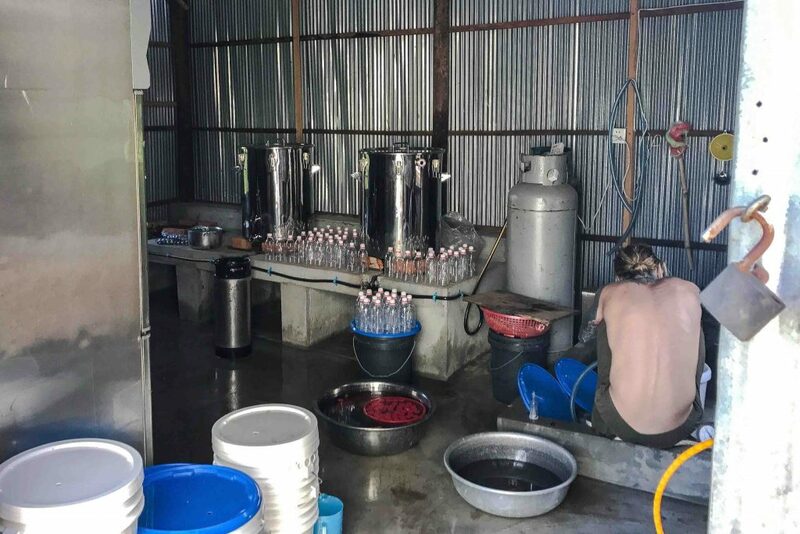 The industry is still in its infancy, so it was relatively easy to visit all of Cambodia’s breweries (there’s six) as I made my way across the country and ultimately to the experience of being a brewing assistant. 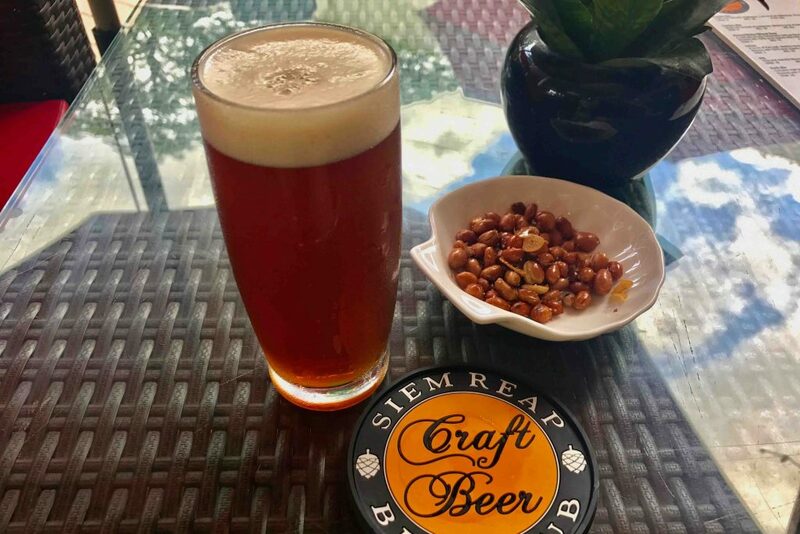 Sihanoukville is home to the Cambrew Beer Factory (really, what could be less appetizing than a “beer factory?”), maker of Cambodia’s national brew, Angkor beer. The city’s famous Ochheuteal Beach conjures up images, for those familiar with it, of drunken partygoers with their hearts set on consuming every drop the Factory can produce before they pass out on the garbage-strewn sand. Five Men Fresh Beer is one of the town’s few bright spots trying to change that image, and they’ve fittingly situated themselves far from the beach debauchery. The brewery is housed in a cavernous sheet metal building that I would describe as looking like a shabby but charming pizza shop. Family portraits on the wall, roughed-up vinyl booths, tables with red plastic chairs – it feels like I should be ordering a slice of greasy thin crust. There’s even a strangely out-of-place fish tank filled with dirty brown water, from which some large specimens can eye the customers. The brewing equipment is located behind glass windows, allowing visitors to watch the process when it’s taking place. Unfortunately, it was very quiet the day of my visit. The brewmaster at Five Men refers to his creations as “fresh beer” because no chemicals or preservatives are added to them, which also means they spoil rather quickly. Not to worry though, because all three brews cost between $0.50 and $1 (the same price as Angkor beer), and at those prices, the product is flying out the door (or rather, into the customers’ mouths). Brews made here include Gold, Stout and Strong, which roughly correspond to lager, stout (obviously), and pale ale. The Gold is a step up from Angkor, but not shockingly different in flavor profile. The Stout has hints of chocolate, though the body is disappointingly light for a stout. The Strong was probably my favorite, less malty and with much stronger hops flavors than the others. 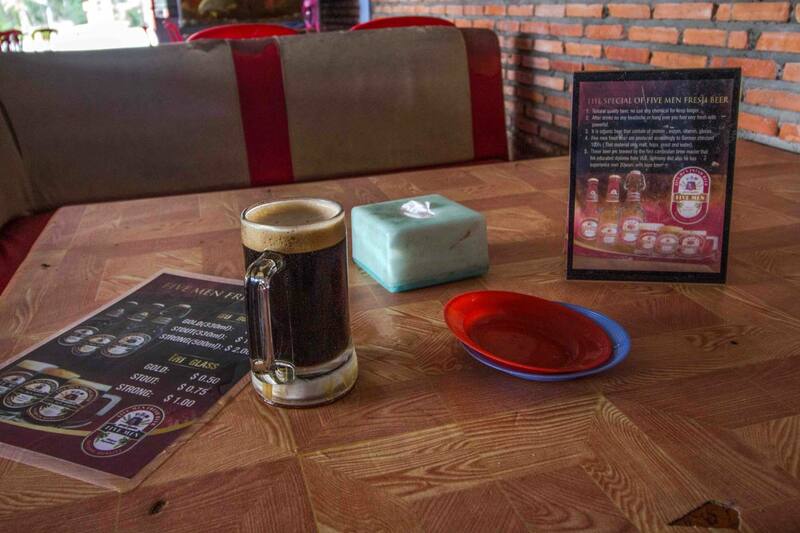 Admittedly, anyone expecting Western craft beer quality is going to be disappointed, but Five Men’s brews are a big improvement over the mass-market Cambodian beer options and not any more expensive. I visited the brewery alone, but it would be a really fun and affordable place to spend an evening out with friends, especially if you can snag a booth. The service was also excellent. The waitress came to ask if I wanted another beer the second I finished the last sip of my first – a level of attention that’s rare in Southeast Asia. Tell your tuk-tuk driver you want a ride to Himawari, and watch their eyes light up – and the fare skyrocket. This luxury hotel on the capital city’s riverside is a popular spot for Western and Chinese high rollers to spend the night after liberating money from their wallets at the nearby casinos. 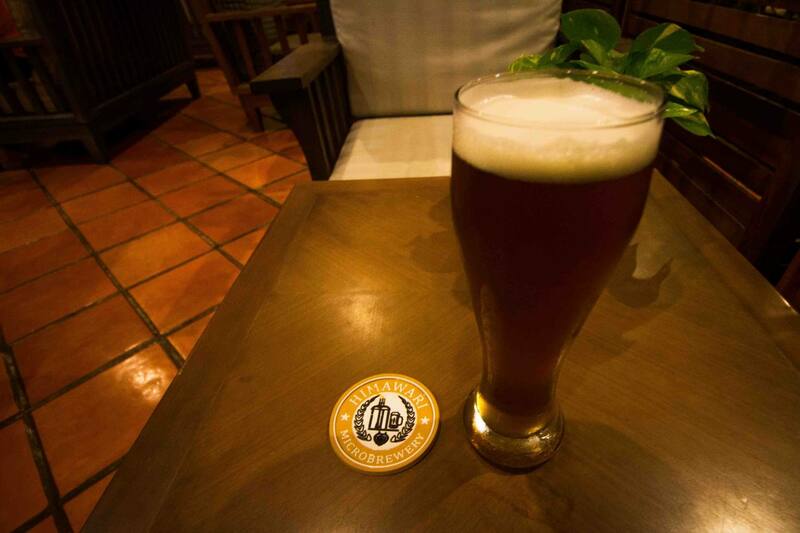 In addition to their posh accommodations, the hotel also started one of Cambodia’s first craft beer operations. The brewery and bar are located at the far end of Himawari’s palatial lobby, so don’t dress like a slob. I don’t think they’d kick you out, but I’m betting people who look like dirty backpackers don’t get great service at a place like this. I really enjoyed the hotel’s quiet atmosphere, with jazz music playing lightly in the background. It was an interesting contrast to the usual party atmosphere of bars in Cambodia. If the weather is clear, the back patio makes an even better hangout, with its impressive views of the riverside. Several of Himawari’s beers are on tap, but I headed straight for the Centennial IPA, yearning to get back to the hoppy bliss I found in Chiang Mai. I was not disappointed, as it had plenty of hops flavor, though it was somewhat lacking in the IPA aroma. I love the intense floral and piney scent of a good IPA, the kind with a smell that becomes just as much a part of the experience as the bitter taste that lingers on your tongue. That’s not to say I was completely satisfied; a pint of Himawari’s IPA costs $7.25 – around the same amount I would have paid in Boston. That sort of pricing is criminal in Cambodia, though it’s a couple bucks cheaper during happy hour. While I enjoyed their flavorful IPA, there are less expensive places in Phnom Penh. Save this one for a date night when you’re trying to impress someone with the luxurious setting. As an “entertainment complex,” this one was an interesting experience. 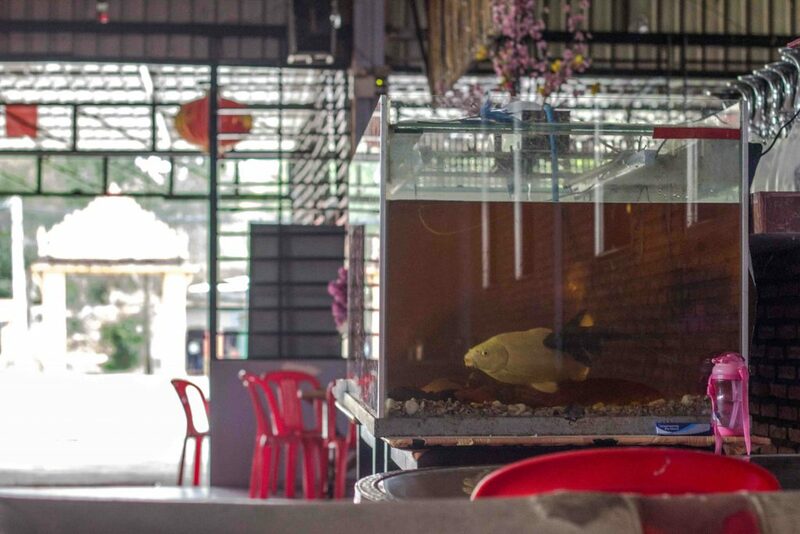 It’s located near the Russian Market, far from the touristy hotels and restaurants that dot Phnom Penh’s riverside. 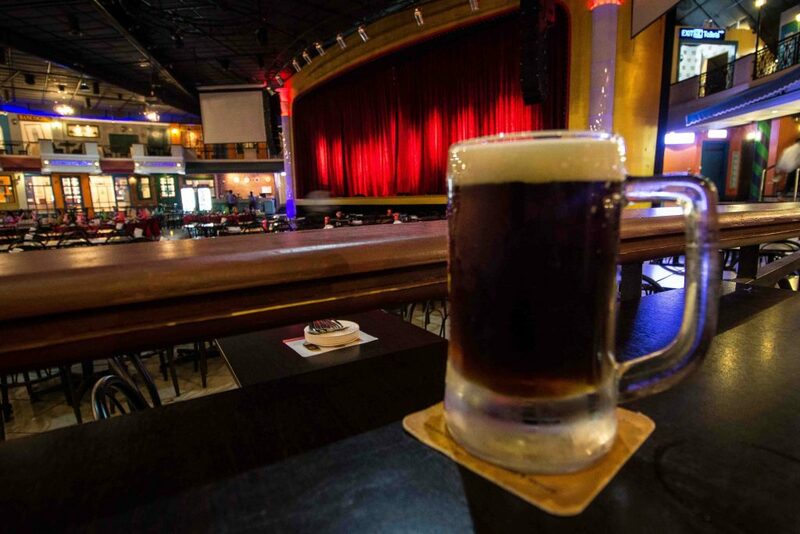 While they do brew their own beer, it’s predominantly known as a live music venue, with performances starting around 6:30 every night. 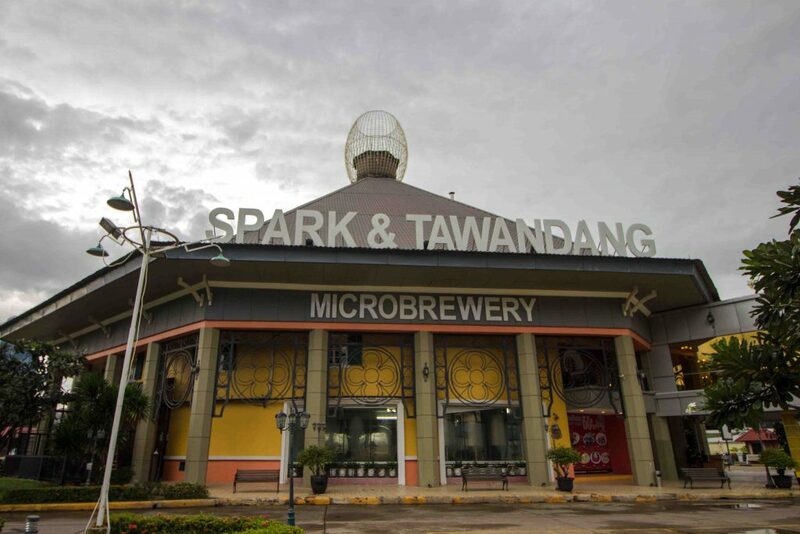 Tawandang prides itself on using traditional German brewing techniques. Though I haven’t spent much time in Germany, I did drink a few beers at the Hofbrauhaus in Munich, and I don’t see how they could be using any of the same techniques. I tried the lager, weizen, and dunkel, which roughly correspond to a light lager, a hefeweizen, and a porter. Honestly, the lager tasted just like an Angkor beer, but cost four times more. The weizen, true to its name, had some wheat flavors and a bit of the yeasty-ness you’d expect from a beer like this. But it was just enough to leave you wanting more, and it was a disappointment to know it could have been much better if they hadn’t skimped on the wheat in the malting stage. Nevertheless, it was the best of the bunch. The dunkel was by far the worst of the three, as it was sickeningly sweet and the malt flavors tasted artificial. I have to wonder if they used some sort of additives to give it a dark color and notes of chocolate. Unfortunately, the food at Tawandang wasn’t much better than the beer. The Thai dishes (their specialty) are nothing to write home about, and selling Pad Thai for $5 seems nuts to anyone who’s been in Thailand. Despite the disappointing brews and food, the show made it all worth it – and this place is more of an entertainment venue, after all. The live music was great, and the whole experience was entertaining and full of local flavor. I was one of the only Westerners in the cavernous bar, and even though less than half the tables were full when I left, I could see it becoming a happening place later in the evening. You’ll have to really go looking for Phnom Penh’s third brewery; it’s located down an unassuming alley not far from the Independence Monument, where you’re unlikely to come upon it by chance. You’ll be glad you sought it out, though, as it opens up to a beautiful shaded beer garden that looks like a backyard BBQ in the States. Perhaps that’s because it’s run by Texas native Erich Phillips, who’s trying to bring the fun atmosphere of American microbreweries to the Cambodian capital. When he’s not brewing, he comes around to chat with visitors, and if you’re unsure of your itinerary, he’s got plenty of great ideas for having fun in the city. Unlike the other Cambodian breweries, which focus on stocking tried-and-true flavors, Botanico has a rotating menu of brews, so you’ll find something new on each visit. I tried the IPA and pale ale, both of which were excellent and had strong flavor profiles designed to appeal to fans of those styles of beer, rather than to be agreeable to the masses. Of all the Cambodian beer I’ve tried, these came the closest to tasting like the craft beer found at home. The food is also reportedly top-notch, but when I visited, most of the staff was on holiday and the menu was limited to snacks. Erich was quick to bring me some delicious and free curry-flavored peanuts while I sipped my beers though, so I can’t complain. Ultimately, this was my favorite brewery in Cambodia. Not only because it had the best IPA, but because Erich has brought to Cambodia the friendly and inviting atmosphere that I love about breweries back home. I’m pretty ashamed to say this, but I missed Kingdom on my first visit to the capital – even though they brew more beer than anyone else on this list. They’re also the only brewery to offer a proper tour. Set in a semi-industrial section of Phnom Penh about four kilometers north of the popular Sisowath Quay, it’s not the most inviting place for tourists. There’s a sign at the main entrance, but no one was staffing the front desk when I arrived, and I had a confusing adventure up to the tasting room. Once I found it, though, I was properly welcomed and invited to join the tour that was about to start. The guide takes you around to all of the equipment and explains the brewing process, though it’s light enough on the details that you might not fully understand if you’re not already familiar with brewing. 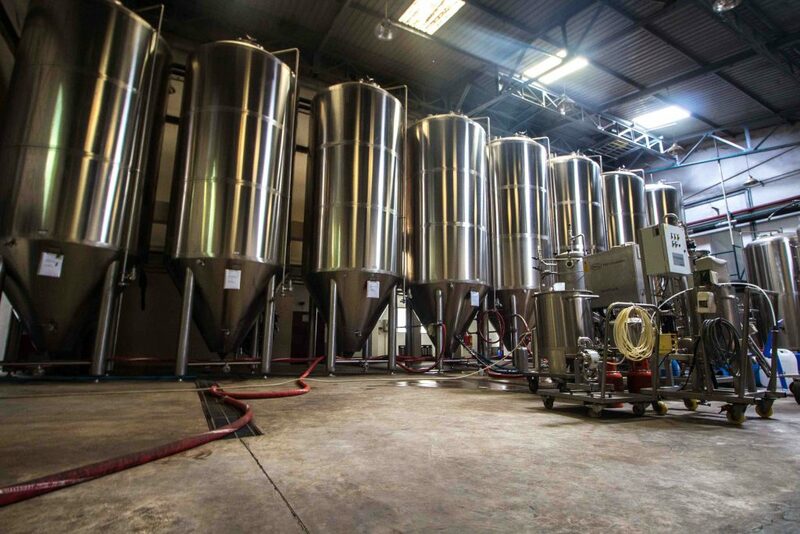 One of the most surprising facts from the tour was that 90% of Kingdom’s production capacity is reserved for contract brewing destined for Thailand and Singapore. 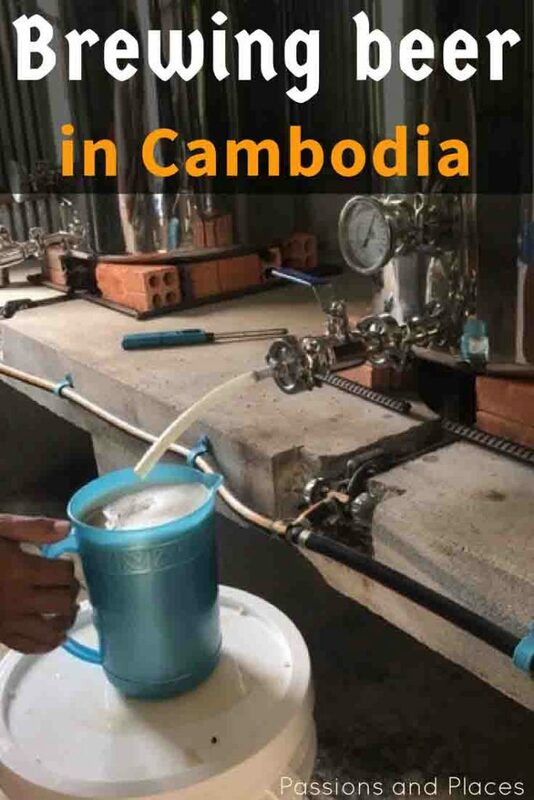 Cambodia has very low alcohol taxes and lax regulations compared to its neighbors, so it’s cheaper to brew there. The tour concludes back in the taproom, where you get to have unlimited “tastings” of each of their beers. 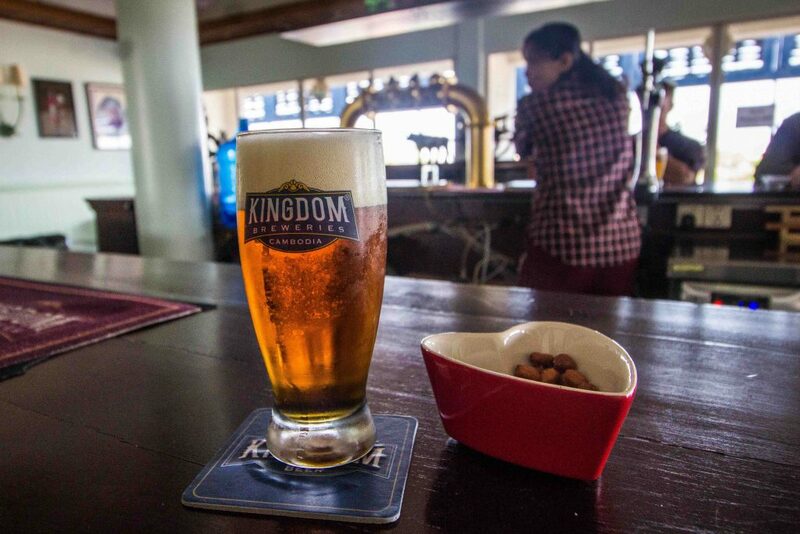 Unlike many brewery tours in the States, Kingdom lets you taste to your heart’s content until they close at 5pm. I sampled all four of their beers, but my favorites were the IPA and White (if there’s an IPA available, it’s usually going to be my favorite, to be honest). The tour is admittedly a little pricey at $15, so bring some friends along and enjoy an afternoon of unlimited tastings to make it worthwhile. There’s no reason to sugarcoat it: I found this to be a terrible beer drinking experience. Munich Fresh Beer is located inside the ultra-modern Aeon Mall, and I can think of few worse places to enjoy a cold one than a mall filled with shrieking, giddy teenagers. 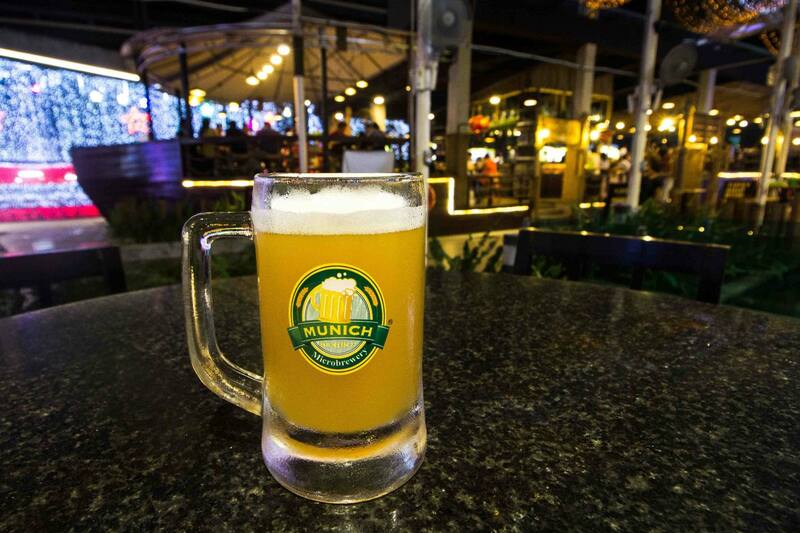 While most of the microbreweries I’ve visited in Cambodia are run by brewmasters with a passion for their craft, Munich feels more like a money-making scheme where brewing is just a novelty. If you find yourself at the Aeon Mall, spend your money on a delicious ice cream instead. 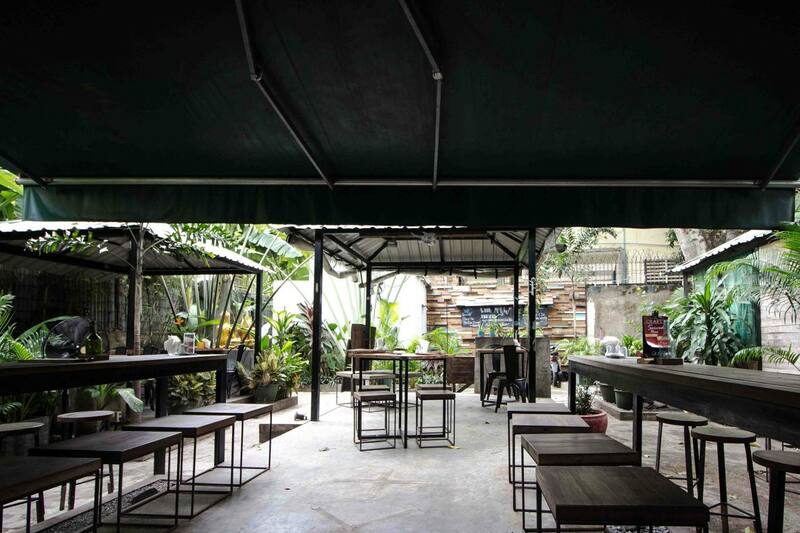 This brewery is a favorite hangout of expats and wealthy Cambodians alike, combining high-end food and craft beer with a fantastic ambiance. If the temperature’s bearable, their beer garden has several picnic tables and outdoor couches where you can enjoy your drinks and some great music. But if it’s too hot, you can head inside to the bar, a game room filled with pool tables and dartboards, or a quiet sitting area where you can relax and chat with friends. Besides the atmosphere, one of the things I most appreciated at Hops is that they offer tasting flights, which meant I could try each of their beers in reasonable quantities. A four-sample flight is about $8 and is about the same price (and equivalent amount) of two bottles there. The flight included their Golden Angel, Amber Witch, Hope IPA and Red Fury, and the star of that flight was definitely the Amber Witch, which fell somewhere between the flavor of a pale ale and maybe a Hefeweizen. If you’re not interested in sampling all of their beers, this is probably the one to get. Riel is perhaps the least well-known brewery in Phnom Penh, probably because they don’t have a dedicated tasting room. That’s a real shame, because they’re producing some of the country’s best tasting craft beer. 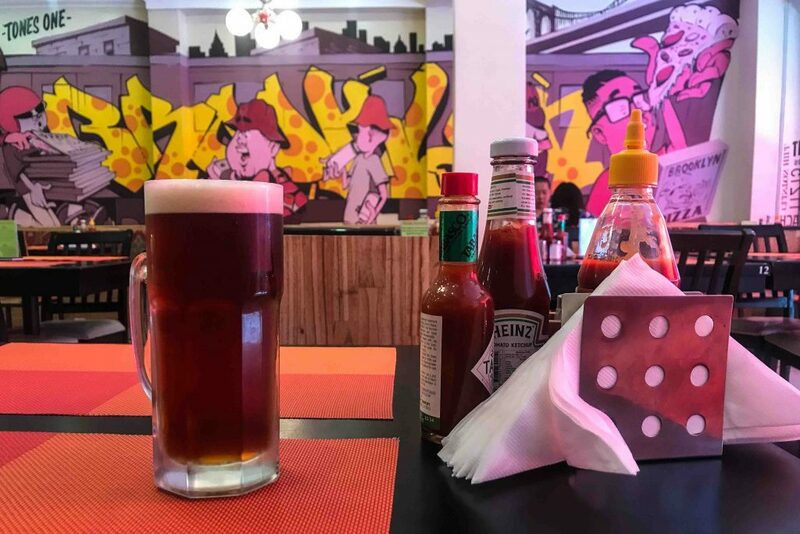 While you sadly can’t visit Riel’s brewery, you fortunately can find it on tap at a few places around the city, which is why I headed to Brooklyn Pizza in the swanky neighborhood by the Russian Market. Like Botanico, Riel is brewed by a couple of Americans who fell in love with Cambodia but missed the deliciously experimental beers from back home. Riel’s producing several different beers right now: a toasted coconut brown ale (this is Southeast Asia, why wouldn’t you throw in some coconut? ), an IPA, a grapefruit pale ale, and a summer session ale. For consistency with my other tastings, I tried the IPA, which oozed hoppyness while maintaining a fairly light body. It’s an IPA for drinkers who aren’t sure they like IPAs or are worried that one could weigh them down for the rest of the day. You want to keep it light when touring a city like Phnom Penh in the sweltering heat, and this IPA was perfect for it. 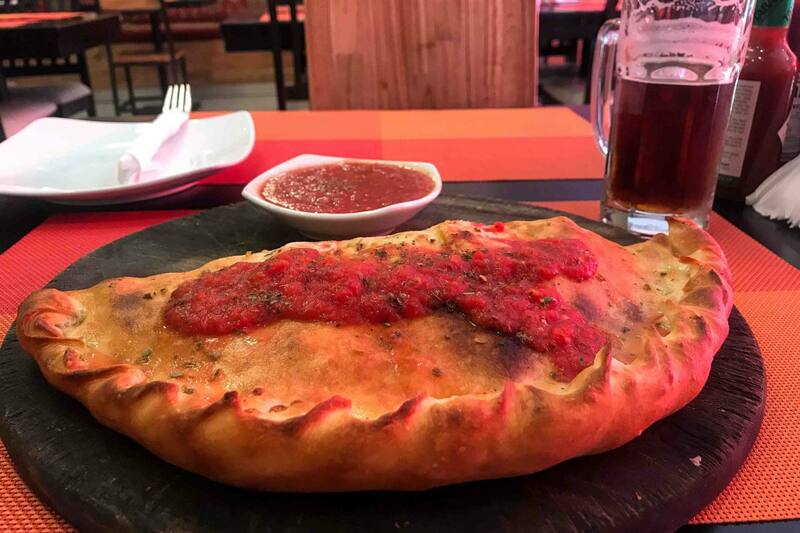 I can’t say the same for the calzone I ate it with, though – which was a heavenly blend of gooey cheeses (including feta! ), fresh vegetables, and an oh-so-buttery crust. If you’re craving amazing Western food in Cambodia, Brooklyn Pizza is definitely the place to go. Who doesn’t want a refreshing beer after a long, hot day of exploring temples? While you can find a $0.50 Angkor beer pretty much anywhere on Pub Street, the Siem Reap Brewpub has the big flavor you’re really craving after an exhausting day. To differentiate themselves from the numerous backpacker bars around town, Brewpub has chosen to go upscale. The outdoor dining area is full of inviting plush chairs and white tablecloths, all under expansive umbrellas to shade you from the city’s oppressive heat. It’s a peaceful, classy place in a city that has become overcrowded with tourists and rowdy backpacker bars. The brewmaster, Neo, is a pioneer in the Southeast Asian beer scene, opening Singapore’s first homebrew store. He then formed the country’s first homebrew club to help other aspiring brewers hone their craft, and started leading tours of the area’s breweries. I tried the IPA (they also offer a honey weiss and saison ale), and was happy to find a high level of bitterness and a pleasant floral aroma. It was the kind of craft beer I’d expect back home, and it only cost $3. This was the last brewery I visited, so I was admittedly, perhaps unfairly, less impressed than I was with my first IPA at Himawari. An unexpectedly good find here was the beer cocktails. Normally, I’d be completely opposed to diluting craft beer with juice, soda, and spices, but after a long day exploring the temples, I can appreciate the need for a drink that has a little less alcohol but is still packed with flavor. I ordered the IPA mixed with orange juice, ginger ale, and bitters, and the wonderfully hoppy taste still shone through. 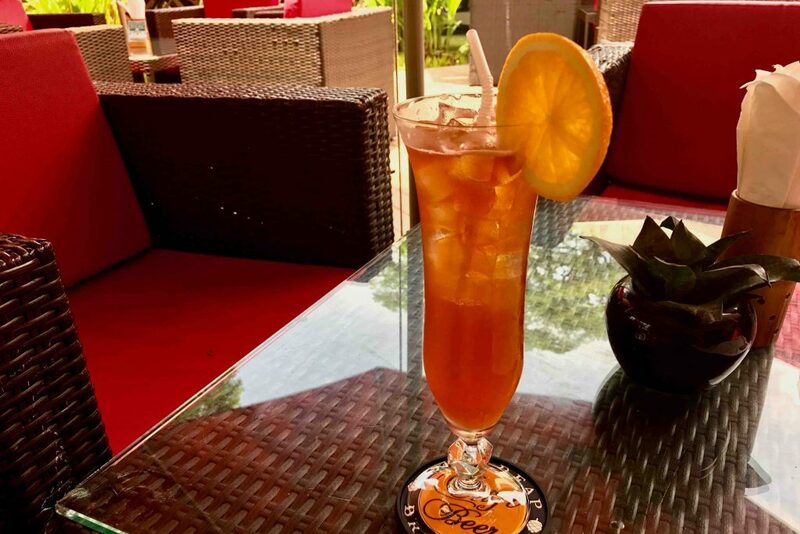 The Brewpub is an excellent place to spend an hour or two in Siem Reap, in between all the other activities the city offers. It’s certainly more interesting than a night out on Pub Street, and you won’t have a thousand touts bothering you to check out their store or take a ride in their tuk-tuk. So, back to that story of how I became a brewing assistant in Kampot. We recently spent six weeks there while Jen was teaching yoga, so I was on the hunt for interesting things to do in town. After that delicious beer in Chiang Mai, I thought it was worth seeing if there were any breweries in Kampot (even though it was an unlikely prospect). What I found was Flowers Homebrew, Cambodia’s smallest commercial brewing operation. Run out of the owner’s house, they brew 100-liter batches every few weeks, enough to fill a couple hundred bottles and several mini kegs. Just after we arrived, the owner, Yuki, posted on Facebook that he was looking for someone to help with bottling – who would be rewarded with two free bottles of beer. I got in touch, and ended up not only bottling, but also getting to help with the brewing. 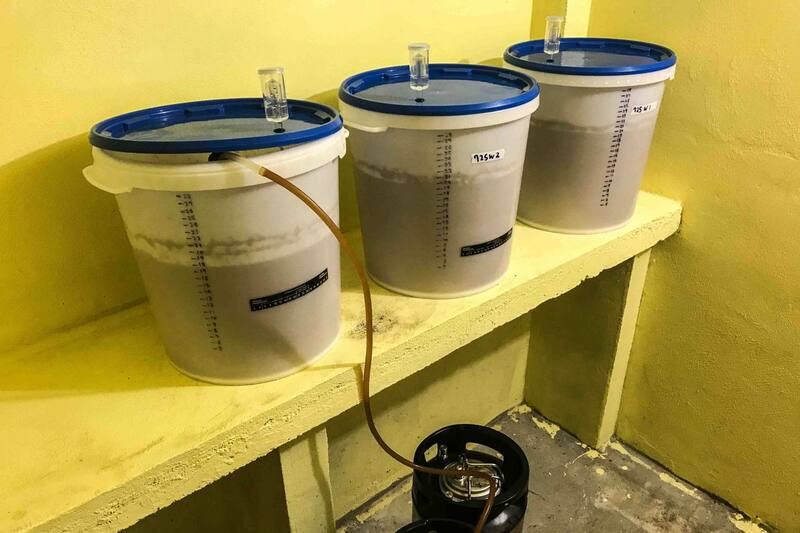 It was a two-day process that involved sanitizing all the equipment on the afternoon before the brew, along with long periods of waiting on the second day as the beer was cooked, transferred, and cooled in a variety of vessels. The most important thing I learned from the experience is how critical cleanliness is. It takes only a small amount of bacteria or errant yeast strain to ruin a batch of beer. Conscientiousness is key to a successful brew. So, how does Flowers’s beer stack up (I promise there’s no bias, the batch I brewed wasn’t even ready by the time we left)? Both the steam beer, a brew made with lager yeast at warm temperatures, and the pale ale were delicious. They’re not quite as aggressively flavored as Botanico’s brews, but are very enjoyable and easily worth the $2 price tag on each bottle. Not to settle for the title of being the sole craft brewer in Kampot, Japan-born Yuki is also the town’s only sushi chef. Flowers serves a variety of vegetarian and non-vegetarian rolls that are a great accompaniment to the flavorful beers. If you’re going to be sticking around Kampot for a while, send Yuki a Facebook message a week or so in advance and see if there’s any brewing or bottling happening during your visit. You can learn how the proverbial sausage is made, and pretend you’re a brewmaster for the day. While it’s been slow going, Cambodian beer is changing, and the country is starting to come into its own in terms of the craft beer market. While Cambodia’s beer sales have long been dominated by a few big companies making a cheap but sub-par product, the market is diversifying. Foreign tourists are certainly the catalyst for this, as they’re starting to demand the same great tastes they can find back home. But maybe these new breweries will also alter the preferences of wealthier Cambodians who are curious to try new things. Hopefully, it will eventually result in not only more variety, but also more small businesses. The craft beer movement helps keep more money in the community instead of in the hands of large corporations. We can all drink to that! Where have you tried interesting craft beer during your travels? Thanks for all the info. Gonna check out Botanico. Cool, looks like Moringa is serving the IPA from Kingdom Breweries in Phnom Penh, which I was definetly a fan of. Sounds like they have some amazing vegetarian food too! 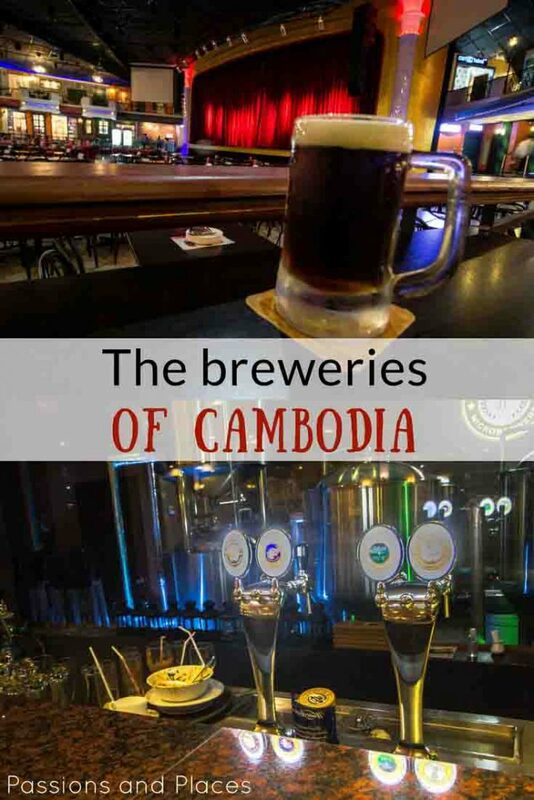 I will definetly be trying out the Local Brewpub next time I’m in Siem Reap and will update this post. As for Botanico, the brewery is called Cerevisia and the restaurant/pub is Botanico. So if you see Cerevisia on tap anywhere, that’s their beer. Thanks a bunch for this blog. I’m heading to Siam Reap in a few days and this is a big help! 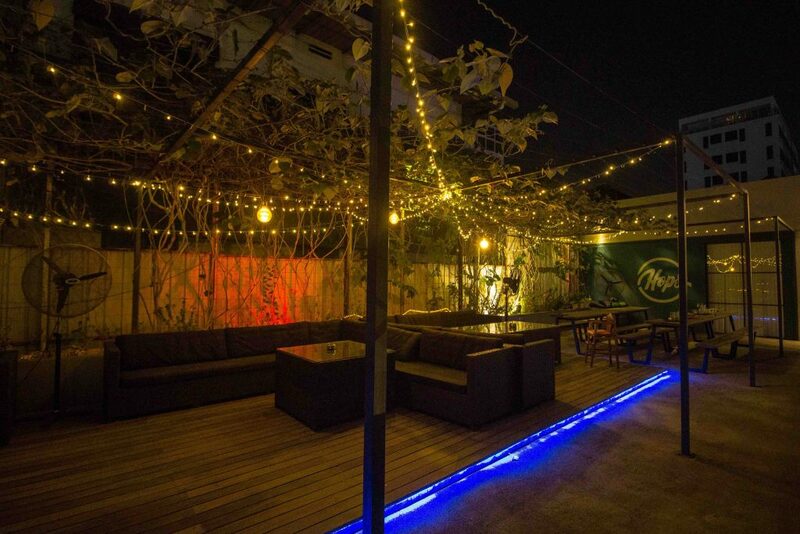 Along with Siem Reap Brewpub, you might want to check out Melita Restaurant on the night market street. 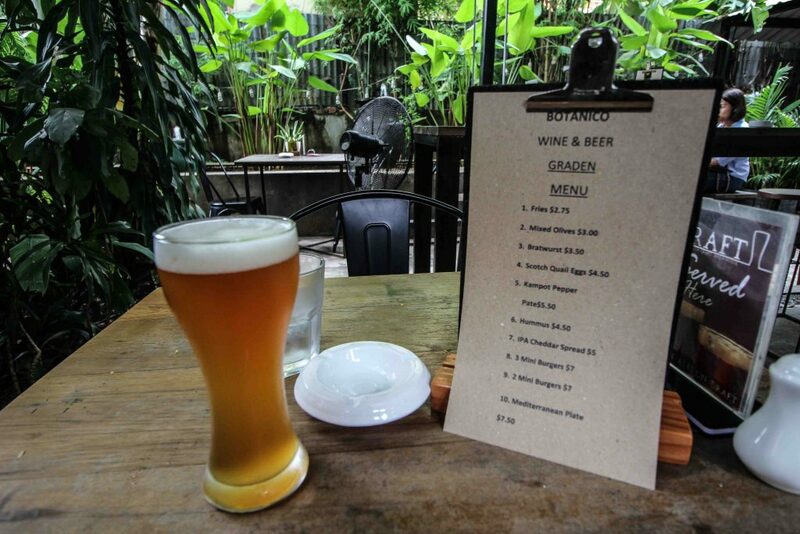 They have excellent pizza, fresh pasta, and craft beer (I think from Botanico in Phnom Penh). Hi Brent, thanks to your comment. I not only expected that there are craft breweries in Cambodia, but I know. that there are more than 6. I personally know some Thais who created breweries at some town close the Thailand/Cambodia border. For example, STONE HEAD Brewing as I posted in my digest blog. I’ve been in Siem Riep many times but few years ago… And I liked this city much more than PP or SVille, but it’s too small for the serious craft beer biz and, as my experience here in Thailand, tourists zones ain’t good places for expensive (even HQ) beer. But, anyway, Cambodia now has all the opportunities for maximum development of craft brewing and I would like to try to participate in this process. 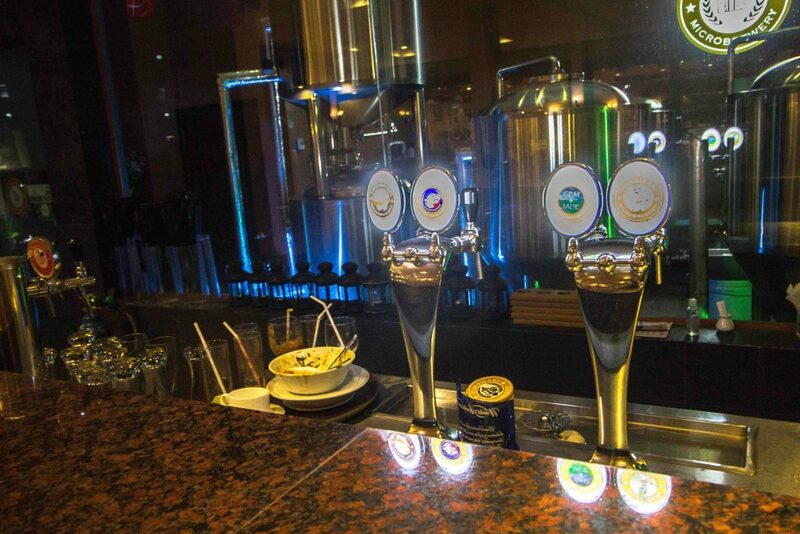 That’s awesome that you’re brewing your own beer in Southeast Asia. 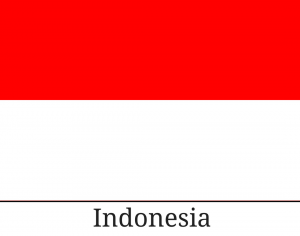 The situation in Thailand is such a mess; it’s ridiculous that breweries in BKK and Phuket need to have their product produced in Singapore or Cambodia and then shipped all the way back. I think you’ll have a lot easier time in Cambodia. I’m not sure all on the legalities of it, but from what I’ve seen the licensing isn’t as difficult and a few brewers forgo the proper permits and get away with it. Happy brewing! Thanks for the tip! I’ll have to look into that if we’re ever in Sihanoukville again. We’re hoping to check that out sometime soon. We’ve heard Vietnam has some great brews! I am heading to Cambodia next year and as a craft beer brewer I will check these all out, thanks for the heads up. Botanico sounds like my place to hang out ! Botanico definitely had the best selection and the best atmosphere. 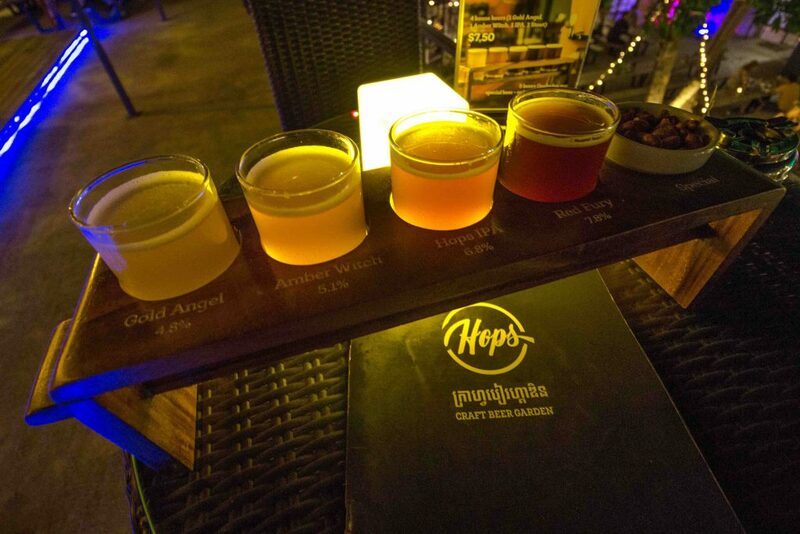 We’ve been all around Southeast Asia, and Cambodia has the most interesting craft beer scene. Enjoy your trip there! Thanks! I loved researching and writing it! It’s really cool to see the beginnings of a movement like this. 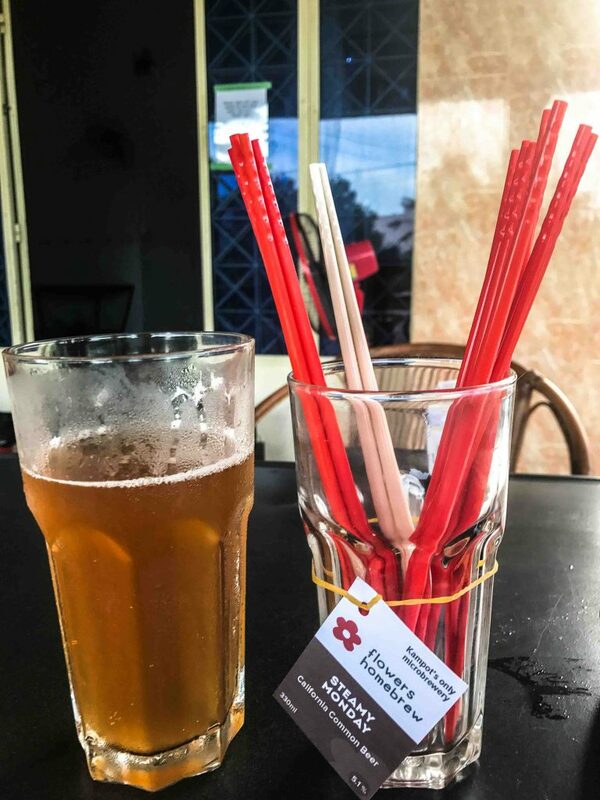 Great post – the research portion must have been fun 🙂 We went to Siem Reap Brewpub and thought it was pretty decent. Definitely a nice surprise since we hadn’t been expecting to find better than the typical SE Asian beer there. It was loads of fun! The Siem Reap Brewpub, while not my absolute favorite, was certainly better than what Pub Street offers. A very nice surprise. I’d be happy to go back and have something other than Anchor and Angkor when in Cambodia. Great thought to cover this emerging scene. It’s cool to see it when it’s on the ground floor! It was so interesting to see how it’s developing. 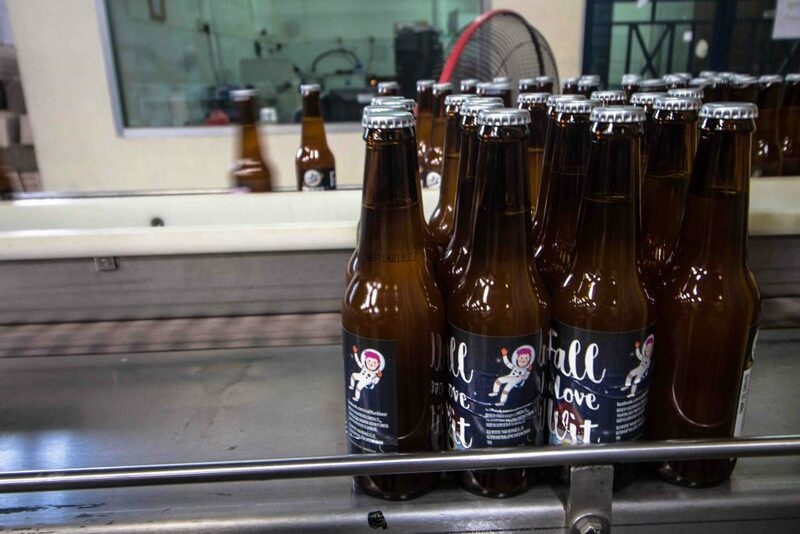 You’d expect craft beer to take off in Thailand long before Cambodia, but high alcohol taxes and extensive regulations have slowed most development there. Cambodia seems to have a pretty open approach to craft brewing (or officials may just be looking the other way with start ups), and they seem to pop up wherever there’s demand for it. One of the stranger things I learned was from the brewmaster in Kampot. He said that it was difficult to get tourists to pay $2 for a bottle when Angkor/Anchor is sold for $0.50. I would think there would be plenty of tourists that would be interested in craft beer, but perhaps they’ve all embraced the cheap alcohol phenomenon (or at least the backpacker crowd in Kampot had). This is a great article. I haven’t been to Cambodia and I don’t drink beer. If I did, i would follow your tracks all the way. Thank you for sharing your experience. Well if you are ever in Cambodia, even as a non-beer drinker, some of the breweries are pretty great places to hang out. Particularly Botanico in Phnom Penh, with it’s great food and lively atmosphere. Glad you enjoyed the post, it’s exciting to see an industry like that developing. I was in Cambodia just over 10 years ago and I had no idea about the craft beer scene, although I do remember drinking the Angkor beer! The first microbrewery only opened in 2011 (Himawari), so it’s a pretty recent phenomenon. It’s a nice change from Angkor though.